Discussion in 'Hi-Fi Stereo Systems & Separates' started by puffy5, Feb 22, 2013. I've started this thread on behalf of my father-in-law who is after some advice on upgrading his setup. My Farther-in-law has just upgraded his cd player to the pearl lite but he feels that he isn't getting the most out of it with his current set up. He's looking to spend about £1000 on upgrading. Where do you think the money would be best spent? Perhaps a dedicated stereo amp or better speakers such as the Tannoy DC6T SE's? Depends on what he is looking to improve. Speakers can make the biggest improvement and general consensus say the speakers should be around double the amp price but in your dad in law case its reversed. So the dc6t or ones alike or around the £1k should make a substantial improvement. If its music he's wants improving then i be inclined to look at a stereo amp. Preferably one with HT bypass. However in this case it be speakers 1st then the amp. Damn! I had a nice long post nearly finished and lost it. Well, I'll try again. What other equipment does your Father-in-Law have? How dead set is he on getting a full Surround Sound system? In my view if he does specifically need a Surround Sound system, then there is no point in buying one. The Marantz CD-KI-Pearl-Lite Player has 1x Optical, 1x Coaxial, and 1x USB inputs on it, meaning not only is it a CD Player, but it is also a stand alone External DAC (Digital to Analog Converter). Connect your video player to the TV via HDMI, the connect the Digital Optical Audio Out of the TV to the Optical Input on the CD Player, then you will be able to hear the TV from the same port as the CD Player. 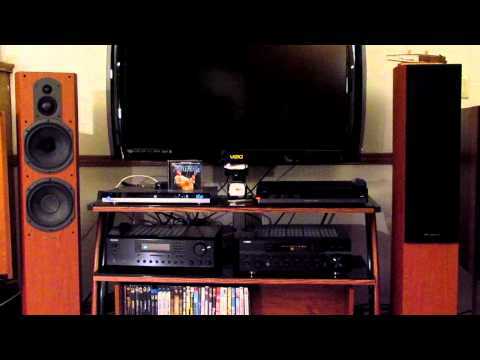 This will work very well for movies, if you have a decent Stereo amp and decent speakers. OK, over budget, but not by much. Also keep in mind there are still some of the older Diamond 10 speaker available, but limited to existing inventory. For example - Diamond 10.7, equivalent of the Diamond 157, price at about £575/pr, though you might be able to find better prices. The Rotel is a very sweet amp, I heard it effortlessly drive some 4 ohms speakers. It has a built-in DAC to allow connection of the TV, and the Blue Tooth allows streaming of music from any Blue Tooth enabled device like Smart Phone. This is a massively powerful amp with a HUGE power supply and massive current reserve. Several member in the Forum have this amp, if you search, I'm sure you will find nothing but positive comments. Really pushing your budget though. Yes, over budget, but substantial quality and substantial value. If not that amp, and he likes Marantz, consider the PM7004 for about £450. The Rotel RA12, while not hugely powerful, it is a very sweet amp, and should nicely drive just about any speakers, and if you feel the extra Digital input and the Blue Tooth are of value, it are certaily worth considering. The Tannoy Revolution speakers should have a voice similar to the Mercury V4's, but they should be a very substantial step up in sound quality. Hopefully that will be helpful. Personally, I'm not surprised he isn't hearing much of a difference with the new cd player. A different amp (unless it's unfit for purpose) won't make a bit of difference in sound quality either imo. Modern audio electronics are basically transparent and can be shown to be quite easily. The only areas of change where I can see a benefit would be possibly the speakers and their positioning and room treatment. Within a certain context, I agree with what TONE-UK said, but only within a certain context. There is a reason why £62 amps cost £62 and equal a good reason why £250 amps cost £250 (referring to Amp Channels here). There is a group that believe all amps sound the same, and perhaps to those individuals they are right. But that ABSOLUTE opinion is substantially in the minority in the Audio World. Oddly, all those saying all amps sound the same, manage to have expensive amps, which seems at odds with their statements. But, he is right, the biggest difference will always come from better speakers. The difference between amps is subtle; the difference between speakers is very noticeable. 1.) Stick with Surround Sound or move to Stereo? 2.) Set preferences and priorities. 3.) Set the Budget and a list of what the Budget needs to buy. If he is dead set on Surround Sound, then ...that's it, he needs a Surround Sound amp. However, it is pointless to use a Surround Sound amp JUST for Stereo. In the case of all or nearly all Stereo listening, he is better off with an New Stereo Amp. Keeping in mind the CD Player he has can be used as an external DAC, saving him £200. Obviously, because I'm biased in that direction, I pointed him toward a range of stereo systems. However, if he is insistent on Surround Sound, and he is going to make that a requirement, then there are certainly options, though not as good, in that direction. If he chooses Surround Sound, then we can work on that. If he wants to keep his current amp, and dump all his money into Front or Font and Center, we can accommodate that. But we need to know what the ultimate goal is. So, set your priorities, set not only budget but what you expect that budget to buy you, then we can focus on something specifically suiting your needs. I already wrote some review and impressions about Marantz PM-KI Pearl Lite and I will post this also here. I own now Marantz PM-KI Pearl Lite for about three months and I still think the same about the unit. I also improved it with adding good quality power cable that sound become even more cleaner that with standard one. If you have good revealing speakers all these upgrades will be well awarded. I have Anthony Gallo Reference 3.5 speakers already for some time now. I bought them new and used them with Musical Fidelity A308 and Musical Fidelity NuVista CD player for few years. Having good speakers is not bad thing at all. If you read a review on the Stereophile about original Marantz PM KI Pearl you will see that reviewer has connected the amp with very high end speakers Wilson Audio Specialties MAXX 3 which are even 10 times more expensive than my speakers. Marantz PM-KI-Pearl integrated amplifier | Stereophile.com. What I found interesting is that his observations are very similar to what I discovered with cheaper Marantz PM KI Pearl Lite. So if I wrap that up I can see that Marantz Pearl gear has a lot of headroom and it can offer an extremely good musical presentation also on the best speakers out there. For some long months I had shortlisted some very expensive amps that I would buy as my next upgrade and plug into the system with my Gallo's. Shortlisted were Gryphon Diablo, Gryphon Atilla, McIntosh MA7000, McIntosh MA6900, Leben CS600. I was closest to buy Modwright KWI 200 as I loved a combo of Modwright LS100 and Modwright KWA100SE that I heard at the dealer. Modwright KWI 200 is an integrated amplifier and has almost similar character as previous mentioned combo, but the price for this integrated is also very high (4.990 EUR new) in comparison to Marantz. Then I just experimented with my budget Marantz gear that I had at home and I found out that is not bad at all with my speakers and in some aspects also better than what I heard with more expensive gear. Then I shortlisted also Marantz PM KI Pearl original and Marantz PM KI Pearl Lite as its sound was on many forums and reviews described exactly what I was looking for and very similar to Modwright character. Then opportunity came and I went with Marantz PM KI Pearl Lite which I would say is the best "recession amp" you can buy and enjoy in full and touch or overpass also some very hi-end gear. I bought it and I was not wrong. I enjoy Marantz PM KI Pearl Lite much more than with some extremely expensive gear that I heard in my system, at the dealers or at the Hi-Fi shows. I'm certain that this is the best amp you can buy for the money. I have a very decent CD player Musical Fidelity NuVista 3D which I just renewed with new transport. Combination with Marantz is very good and much better than my previous combo with MF A308. I can conclude that a lot of audiophiles has too much prejudice about Marantz gear and they do not want to touch it. They usualy say that it is just a mass production for the masses. But from my experiences I can say that Marantz Pearl gear is extremely good gear with simple and great engineering, nice design, smart technical solutions and what counts most with excellent musical result. And you can get all that for a very honest price. I believe that Marantz PM KI Pearl Lite is one of the best value solid state amplifiers available on the market. After all these days I'm still amazed how good it is and it really drags me into the music. And that is all what is important for me. I don't like the amplifiers that are just effective for a short period of time with all that audiophile trickery and then at the end you find out that it starts to annoy you with some spitting or sibilant sounds and that with time you find out that music is robbed of the soul and emotions. With Marantz PM KI Pearl Lite I can finally enjoy music for hours and hours. Marantz has tone controls and I give this feature a big plus as I use amplifier also for listening of the Internet radio stations and there you can compensate a little bit. My bass tone control is in neutral position, mid is in neutral and highs are at 11 o'clock at the moment. When needed I just turn off Source Direct and this way no music can annoy me anymore. But on average and also when listening to my CDs I'm bypassing tone controls as I found out that I receive a little more dimensionality and deeper sound stage. Music is so sweet to listen through Marantz PM KI Pearl Lite. I can confirm again that is the most natural sounding amp I had in my system. I can describe sound as very coherent through all frequency spectrum and nothing is hanging out. Musical presentation is just very involving and smooth. I can compare Marantz PM KI Pearl Lite with some very expensive amps and I would still rather opt for this amp. Before purchasing this amp I had also Modwright KWI 200 shortlisted, but to pay 5.000 EUR for an amp and that maybe at the end I will not be completely satisfied what I would pay for? I did not take a risk. Marantz PM KI Pearl Lite has also few advantages in comparison to Modwright KWI 200. It has phono input by default (didn't tried it yet), it has tone controls, it has balance control if you need it, it has headphones output which I use, and it has A+B speaker binding posts which I need as I use also 2x REL B2 for my lowest octave. Here is also my first impression and review I posted. Click. Thanks everyone above for your ideas and suggestions, much appreciated. My Father-in-law opted for the Tannoy DC6T SE's with a Roksan Kandy K2 amp. He has the system set up so that when he listens to CD's it is just through the Roksan and DC6T SE's. For movies the Roksan powers the front left and right speakers with the Yamaha powering everything else. It sounds great. Marantz / B&W upgrade options?